The CoreAlign satisfies my appetite for fluidity & fun. At finetune pilates, we are continuously expanding knowledge of our craft, to help our clients develop theirs. 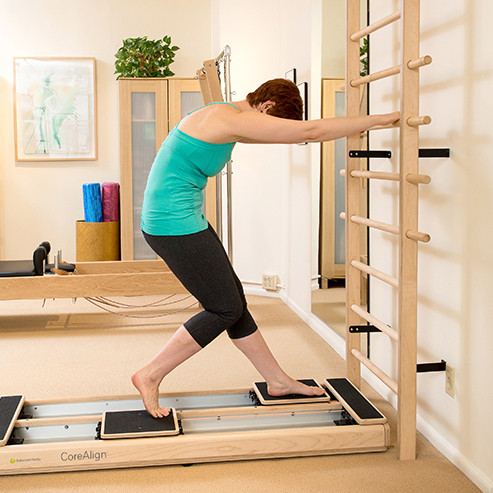 With the new CoreAlign apparatus, we can now take Pilates principles to the vertical plane. With moveable carts that create a balance challenge and require deep core support, the CoreAlign has a rhythm all its own. It teaches the importance of fluid motion, momentum, and ease within the most challenging of movement sequences. As the perfect compliment to our current Pilates program, the CoreAlign is often incorporated within your private sessions, to help you experience your body’s functional strength, and grace.